DELIGHTFUL !! 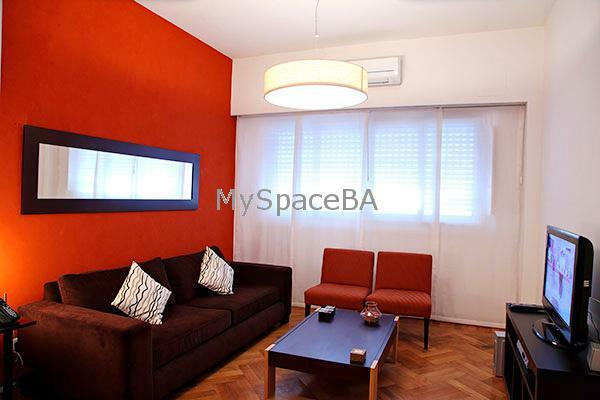 three bedrooms apartment very well located , in Patio Bullrich area , on the corner of Libertad St. and Libertador Av., surrounded by many five star hotels . The apartment is very bright and it offers a beautiful living room with comfortable sofa , cable TV, TV LCD 32" . It has a comfortable dinning area with table and seats for six . The fully equipped kitchen is coneccted to the dinning area via a breakfast bar. The master bedroom has a queen size bed and walk in wardrobe , aircon , safe box and TV . The second bedroom has a Queen size bed which can be separated in two single beds. Aircon . Both bedrooms have double glazing. There is a complete bathroom with jacuzzi tub and shower. The third bedroom has a sofa bed and en suite bathroom with shower . Pet friendly. Handicapped adapted! Very good option to make your stay really memorable. Three aircon hot / cold . Bedrooms with double glazing . Internet Fast Connection . Wi Fi . LCD 32" y TV . Music System . Landline telephone for local calls . Safe box . Two bathroom . Kitchen equipped with refrigerator , freezer . Toaster . Blender . Microwave . Dishes . Kitchen utensils . Towels and bed linen . Cleaning service .